It's hard to believe that this is the 28th year that the USA Film Festival has been holding it's KidFilm festival.The largest children's film and video festival in the US hosts bus loads of school kids from local schools and teaches them about film making and important social topics that are covered in the films. Then there is a weekend of programming that is open to the public where special guests come in and share their crafts with the audience. 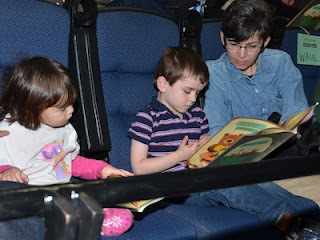 This year Peter Brown - celebrated author and illustrator of books that appeal to the kid in all of us attended. Not only did he introduce 2 films that were made of his books,but he also gave everyone in the audience a copy of "You Will Be My Friend". We all read the book together, then Peter autographed them for the kids. As a Family Lifestylist®, it is always so rewarding to be a part of opportunities like this where families can enjoy quality programming and we can all learn together. Having the opportunity to volunteer at amazing events such as this are the reason I love being on the board for The USA Film Festival. It's a group I've been involved with for years, and seeing families being able to enjoy quality events like this one make it very rewarding. If you live in the Dallas area you should look into becoming a member of this amazing organization. They have special screenings many with guests in attendance all year long, and being a member gives you the chance to get tickets to many of these sold out events before the general public. For more information give them a call at: 214-821-3456.